The quality of our rivers tells us how well we are sustaining our natural systems as development spreads across the state. One frequently used measure of the quality of freshwater systems is the level of dissolved oxygen in the water. Aquatic plants, animals, and bacteria all depend on and consume the oxygen in the water. Nutrient-rich pollution from agriculture, animal waste, and lawn fertilizers leads to rapid growth of bacteria and algae, which consume the oxygen, making it difficult for other plants and animals to survive. Consequently, the level of dissolved oxygen (DO) in river systems is a simple, widely-used indicator of water quality and the ability of the rivers to support aquatic and human life. 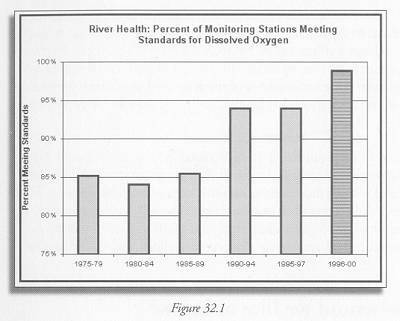 Figure 32.1 shows the share of New Jersey rivers and streams that met the state’s standard for dissolved oxygen. This improved substantially between the 1980s and the 1990s. Note that each bar covers data over a several-year period, and not all periods are of the same length. In particular, the last bar overlaps with the previous one; the very high five-year average suggests that water quality is improving steadily. Data are published every two years; the next update, in 2004, will cover 2000-2002. Populations of aquatic insect larvae and other organisms that live in streambeds – so-called “benthic organisms” – are also used to indicate the overall health of river ecosystems. These organisms are like the proverbial canary in the coal mine, because they respond to improving or degrading conditions faster than fish. 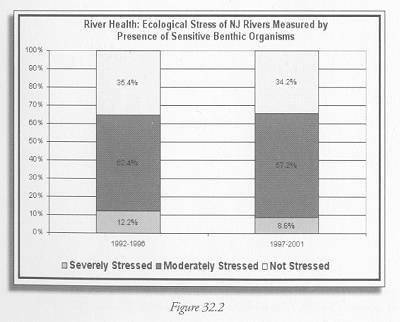 Figure 32.2 shows the share of river stretches that were healthy, moderately stressed, or severely stressed based on measurements of benthic organisms. The baseline data, collected between 1992 and 1996, showed that approximately 35 percent of the tested rivers were not stressed, 52 percent were moderately stressed, and 12 percent were severely stressed. A resampling between 1997 and 2001 showed decreases in both not stressed rivers (bad) and severity stressed rivers (good). Figure 32.2 NJDEP, New Jersey Environment 2000. “Clean & Plentiful Water.” http://www.state.nj.us/dep/dsr/njenv2000/Clean%20Water.pdf, pp. 2,3.